Winter weather calls for blankets and warming herbal teas, many of which can be made once you have the knowledge and taste for blending your own herbs. Sarah Farr, author of Healing Herbal Teas, grows herbs and practices the art of blending with two herbal tea businesses in the Pacific Northwest. 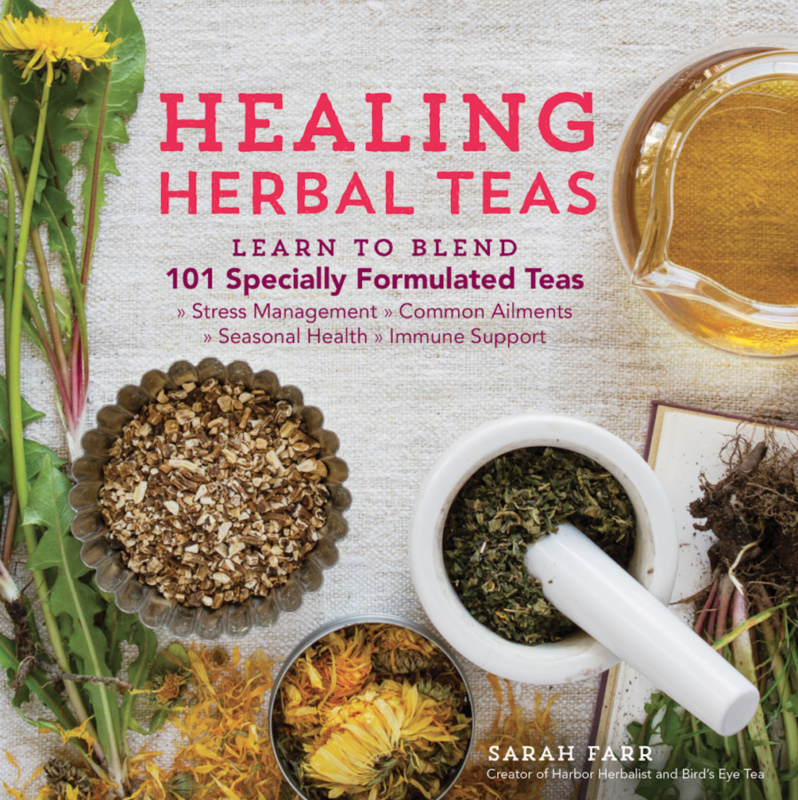 In her new book, Sarah shares her herbal tea 101 knowledge and countless original recipes for herbal tea blends that can be enjoyed year-round. We connected with Sarah and had the pleasure of learning more about her personal herbal journey and tips for blending beginners. And because we know that you want to jump in and start blending, Sarah has shared her Wellness Tea recipe as an exclusive for readers of The Daily Tea (just click the image below). What inspired you to write Healing Herbal Teas? I have a small herbal tea business that provides loose leaf herbal teas to my close community. For myself, an essential part of being an herbalist and medicinal plant farmer is that you are always looking for new avenues to get the word out about herbs and the therapeutic possibilities of herbal teas. It is important for people to have access to both good quality herbs and the knowledge of how to use them effectively. Writing a book was a way for me to share my knowledge and inspire as many people as possible to give therapeutic herbal teas a try. The better we can take responsibility for our own health and actions the more connection we will feel to the world around us. How did you become a master herbalist? I have been a professional cook since college and slowly began growing my own food, spices, and medicinal herbs that I used for my own health and healing. My sister actually inspired me to become a serious herbalist about six years ago. I have always felt an affinity with nature and have spend countless hours in service to the ecosystems in my bioregion. My sister is an herbalist and midwife, she helped me recognize the depth of the connection between the human body and the health and vitality of the earth. She encouraged me to study and build a life at the nexus where humans and ecology intersect. Human physiology is fascinating and we have so many different ways to approach the depths of what it means to be a balanced human. I am constantly studying the ecology of the body and investigating how what exists outside our bodies literally becomes part of who we are in the present moment, this happens through absorption of nutrients and neurologically through our senses. Long story short, I went back to school to study human physiology and self taught myself herbalism through study, observation, direct experience, and the practice of working with my customer. Granted I have worked closely with other herbalists and my work rests squarely on the shoulders of more experienced contemporary herbalists, holistic healing traditions, and all the healers that have been working with medicinal plants throughout our evolutionary history. My experience and education in botany and environmental science gave me a great foundation for understanding the chemistry of plants and how they influence the balance of our physiology. What are some of your favorite recipes from the book for the winter season? During winter I heavily rely on Wellness Tea and Late Winter Woodsman Tea. Wellness tea is my go to tea when I notice that my body is being pushed to it’s limits during winter. I still spend a lot of time outside in winter…when my body gets wet and cold too many days in a row I start to feel my energy wane. At that point I start drinking Wellness Tea and take a rest. Late Winter Woodsman Tea just tastes delicious and feels so comforting on a cold, wet, dark winter day. It is both soothing and uplifting. What is a great herb to enjoy in the morning? And in the evening? I drink a tea with tulsi just about every morning. My brain and nervous system feel really healthy when I consistently drink tulsi instead of caffeinated beverages. In the evening I am a huge fan of skullcap. I suffer from a constantly chattery mind. My thoughts keep me alert and energized late into the night, skullcap helps and reminds me to relax. How do you source your herbs? I grow a lot of the herbs I use. But for herbs that I do not grow I network with other organic farmers for herbs or source from distributors that I trust. I try to build connections with farmers in bioregions that are different than mine. For example, I have been trying to establish relationships with farmers in Hawaii to grow some of the tropical species that I rely on. It is my dream to actually source all the herbs I use from US farmers in the next few years. I think it is vitally important to support small to medium sized organic farms in this country. The years of exploiting poor farmers and their lands in other countries needs to come to an end. Is it better to use fresh herbs or dry herbs? I do not think one is better than the other. Fresh herbs are great to use when they are available. The window for using fresh herbs in tea is very narrow in much of the country. Some herbs such as chamomile are only in their flowering stage for a few weeks in early summer. So during that time drink as much fresh chamomile tea as you want, but once it goes to seed you can start using the dried form. I make fresh herb teas in the spring and summer as much as possible. I love the vitality and taste of fresh herbs in tea. You feel like you are directly connecting with the energy of the plant. The taste is often more subtle when using fresh herbs and you usually have to use a much larger volume of fresh herbs than when they are dried. Dried herbs make sense for long-term storage and use. Most of the time I use dried herbs for the teas I make for others and myself. Dried herbs, when the plants have been grown, harvested, and dried well, are nearly as potent as when the herb was fresh. When it comes to formulating herbal teas, most of my blends are formulated for use of dried herbs. Only in the summer section of my book to I have recipes for fresh herb tea. Dried herbs can be used all year round and store well so for tonic blends or teas you want to drink regularly I suggest focusing on dried herbs. What tools does a beginner need to begin blending herbal teas? My book is a great tool for a beginner. It gives you a starting place. To make a tea you need a few basic pieces of equipment: two mixing bowls, a digital scale, bulk herbs, and a recipe. That’s it! If you are formulating your own blend then I suggest a notebook to write all your ideas and efforts down. What are your top tips for someone who is new to blending tea? I really encourage people to have fun and follow your instincts. Anytime you learn a new skill there is a lot of trial and error. Trust me, this is part of the fun. There is nothing forbidding about making tea. It is fun, creative, and exciting. Dedication to the practice of making teas inspires the tea maker to learn about their own body and medicinal plants in a whole new way. Nature reveals itself to the tea maker, nature becomes personal and universal at the same time. Sarah Farr is the author of Healing Herbal Teas. She operates two herbal tea businesses in the Pacific Northwest — Harbor Herbalist and Bird’s Eye Tea — where she creates tea blends that are delicious as well as effective. A student of herbalism, Farr grows and wildcrafts most of the herbs she uses in her blends and owns her own farm, Orchard Botanicals.